Gown Shopping Can Be Fun & Part of Your Memorable Journey. At Blush Bridal, our gowns many beautiful and different fabrics, beadwork, embroideries, laces and styles available to you. This is a once in a lifetime experience and you should take your time and enjoy it. Our designers will modify your gown at your request. They can redesign your gown with custom changes such as raising/lowering the neckline or waistline to removing or adding beadwork. You can change your gown’s color, the fabric from satin to silk or make your train longer, all at your request. Your gown will be uniquely you. There are many factors that help us visualize your big day. Factors such as time of year or location, whether the beach or a cathedral, will help influence your decision. Your body type (see our style guide) will direct us in which style will flatter you and make you look your best. After being measured, you will place your order with your specific changes of color, size or custom changes. Your gown should be ordered at least 8-12 months before your wedding date. If you are in a hurry, we have our gorgeous stock selection and we can check with the designers for stock availablity. Your gown selection will also dictate the other bridal necessities such as undergarments, veils, shoes and jewelry, all available from stock to custom items. We continue our service with our in-house seamstresses and you receive their expertise (over 35 years experience). If other salons offer alterations, they often require that their seamstresses split fees with them either 60/40 or 70/30. Therefore they charge 30 to 40% more to compensate them. We do not ask our seamstresses for compensation, therefore passing the savings on to you. After your alterations, an appointment will be made to pick up your gown, usually the day before your wedding. Your stunning gown, slip and veil will be steamed and pressed for you, compliments of Blush Bridal. It’s a big day for Mom too! Her little girl is getting married! Mothers will want to choose a color that will compliment the colors of your bridal party and stay within the formality of the wedding. We carry Daymor, Montage and Cameron Blake. We like to pride ourselves in understanding that mothers want to look amazing as well. Purses and shoes are dyed in house to match her gown. Your Bridesmaids can choose from stunning selections, many with 54 color options. The groom and his party should come in no later than 2 months prior to the wedding date to get measured. The sooner the order, the better the selection. Out- of-town groomsmen can get measured at their local Jim’s formal wear. They can email or call in the measurements to us. Traditionally, the groom will be in white or ivory vest and tie. The groomsmen should be in a coordinating color with the bridesmaids attire. Black vest and ties distinguish the fathers from the groomsmen. Tuxedos are available in many colors and sizes. 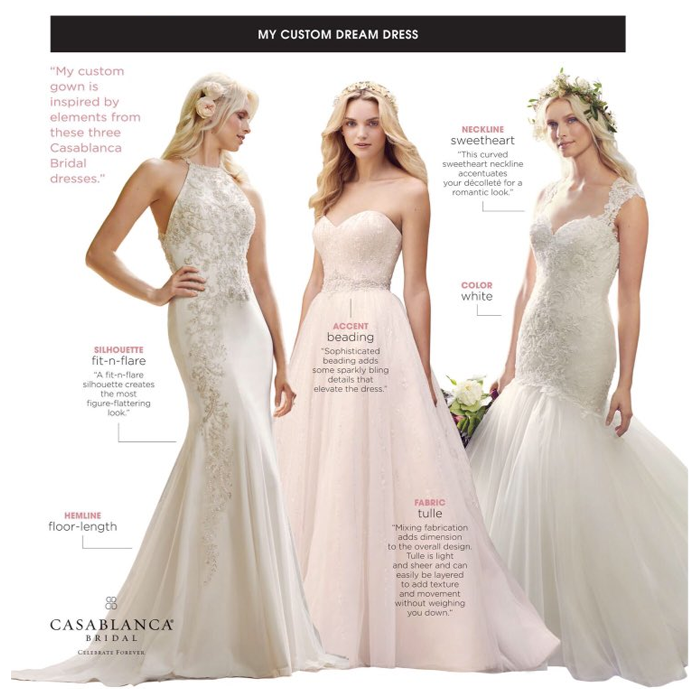 Custom Casablanca Gowns Design your own Casablanca Gown at Blush Bridal NH today!